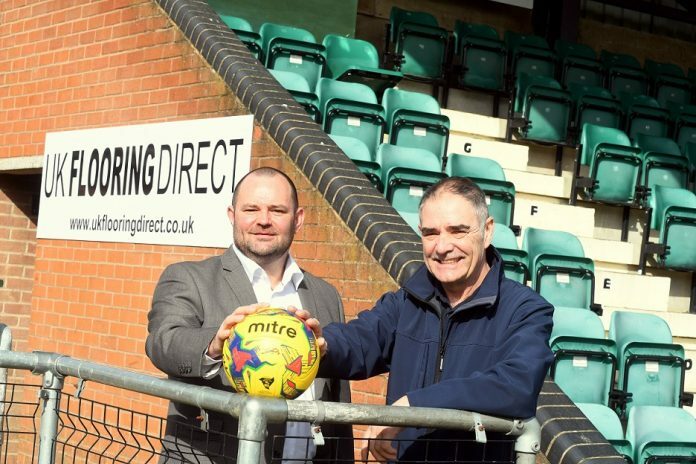 Barwell FC is hoping a three-year deal signed with Hinckley-based UK Flooring Direct to sponsor their stadium in Kirkby Road and have the company’s name on six advertising boards will spur the club onto bigger and better things. The non-league club, which currently plays in the Southern League Premier Division Central, reached the first round of the FA Cup for the first time in their history in 2015, and regularly plays in the FA Trophy. David Laing, chairman of Barwell FC, said the five-figure per year deal could help keep talented younger players at the club for longer. He said: “We’re very fortunate to have local company UK Flooring Direct – which has a national reach – sponsor us for three years. It’s a real feather in our cap. “All sponsorship deals are crucial for any football club, but they’re especially important for clubs of our size. “Their money will help us nurture and develop younger players, and should hopefully encourage them to stay here for longer than they might otherwise do, which could bring us more success. “It should be a win-win situation for the club and UK Flooring Direct. Our average attendance is around 200, but when big games come around we can attract just over 2,000 fans. Jason Ashby, CEO of UK Flooring Direct, said supporting local grassroots and sporting organisations was important to the company – and to its staff. Jason said: “Sponsoring Barwell FC’s stadium made perfect sense for us. They’re a club which is on the rise and one that we’re proud to have our name associated with. “Barwell made the first round of the FA Cup for the first time in their history in 2015, and we believe they can get there again with our support. “We hope our funding will help encourage Barwell’s players to stay on and drive the club to greater success.